As OSCE Chairperson-in-Office and Slovak Foreign and European Affairs Minister Miroslav Lajčák stated during today’s meeting with Georgian Prime Minister Mamuka Bakhtadze, he highly commends and supports the Government of Georgia in the development of Georgia’s democratic institutions and reforms seeking to boost economy and business. According to the Prime Minister’s press office, the conversation revolved around the priorities and future plans on the OSCE agenda under Slovak chairmanship. As it was pointed out, Slovak chairmanship focuses primarily on the humanitarian state of conflict-affected populations and practical ways to improve their lives. 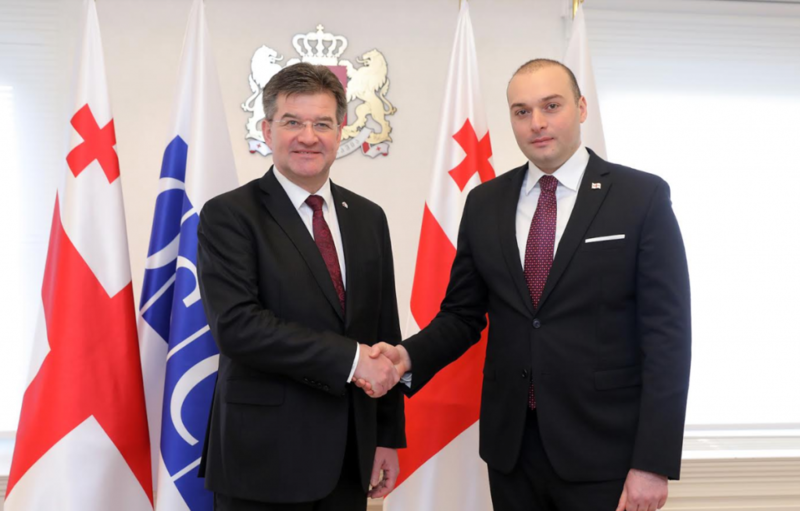 The Head of Government thanked the OSCE Chairperson-in-Office for supporting Georgia’s territorial integrity and sovereignty and for visiting the occupation line where Minister Lajčák familiarized himself with the situation on the ground. The Prime Minister also spoke of the Georgian Government’s peace initiative A Step to a Better Future designed to build confidence among the conflict-torn community. The meeting also discussed Georgia-Slovakia bilateral and multilateral cooperation, along with prospects of furthering the security, economic, human rights, and democratic ties.